As I discovered much later, she had some facts mixed up. The 4,000 Jewish children (exactly 4,115) who were rounded up by French police in and around Paris on the early morning of July 16, 1942, were first transported in Paris SNCF city buses, not to Drancy but to a huge bicycle-race stadium in the 15th arrondissement. After four days in the wretched conditions of Le Vélodrome d’Hiver, the children, with 4,045 Jewish adults, were transported from “Le Vel d’Hiv” to the Pithiviers and Beaune-la-Rolande internment camps in the Loire Valley. From there, they were sent by bus to the Drancy camp, and later from there, by train to Auschwitz. Drancy, barely six kilometers from Paris, interned adults directly from La rafle (the roundup) and in subsequent arrests – a total of 4,992 were unmarried, or childless couples. My mother’s information was incomplete, but additional facts wouldn’t have changed her moral. Having somehow learned, at this late stage in life, how she’d been betrayed by her longtime love, the French – worse still, the Parisians – she wanted out. If I wouldn’t join her in rejecting the city that never failed to inspire either of us, she still could taint my Paris experience, past and future. At least forty years before the Holocaust, both sides of my Jewish family had emigrated from Europe to the U.S.: not a single relative perished. Now, another forty-five years later, why conjure heart-rending images of the lost children? I chose to look the other way – and in the Paris of the ’80S, I could. Plaques on buildings honored fallen French Resistance fighters, but rarely did they remind passersby of children rounded up by Paris police officers in La Grande Rafle du Vel d’Hiv. 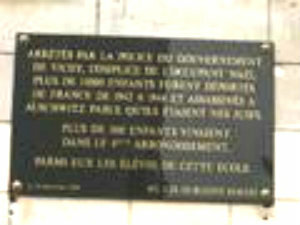 Bordeaux students on a class trip learned about the WWII fate of Paris Jewish pupils. During the 2007 trip, Arnelle photographed this plaque honoring Marais pupils murdered at Auschwitz. On July 16, 1995, as I would learn while planning this article, French president Jacques Chirac changed the tape that had played in his country’s psyche for 53 years to the day since La Rafle in Paris. (Copies of the Paris police roundups of Jews quickly followed in other parts of France.) “Yes, the Nazi occupiers’ criminal madness was abetted by the French,” Chirac said, the first major political figure to emphasize the fact aloud, “– by the French State.” Politicians now copy his stance in their commemoration speeches. Controversy ensued – and still lingers – over whether or not the wartime Vichy state was “French.” But, commemorative plaques began to appear on Paris schools, reminders of children who never returned to class after July 16, 1942. A Holocaust museum, the Shoah Memorial, had opened and yes, I “planned” a visit. I could hardly have been slower to follow the vague plan and managed for years to guiltily hurry past signs that showed I was steps away. On French websites, I read a vivid sample of the debate about French responsibility for the deportation of Jews to the death camps. These hundreds of posts commented on “La Rafle,” a film by writer/ director Roselyne Bosch, who’s not Jewish. The filmmaker’s narrative of the July, 1942, roundup, and the characters, are built around well-documented true accounts. Opening in Paris in 2010, “La Rafle” sold almost 1,800,000 tickets in two weeks, and its July 2012 New York premiere, in cooperation with the United States Holocaust Memorial Museum, at the JCC in Manhattan sold out. Bosch’s work is balanced; reflecting the historical reality, she includes fact-based examples of French righteousness. “La Rafle” does her own devoir de la mémoire, memory work – and she assisted those 1,800,000 Parisians in theirs. The work is vital; must continue indefinitely. In Fall 2012, the general New York audience, often unfamiliar with the French roundups, could catch Bosch’s film at the Quad Cinema. Meanwhile, during that same time frame, I attended a well-publicized exhibition, “C’étaient les enfants” (“They were the Children”), in a special gallery at the Paris City Hall. Plentiful documentation of the youngest French victims deported to the death camps came from the collections of the Shoah Memorial museum. Seventy years after the diabolical roundup, as I looked at photos of the children alongside their letters, drawings, clothes and makeshift toys, I continued my inner dialogue with my mother. More memory trips to follow on GallicFever.com . . . . This entry was posted in History + Politics and tagged Auschwitz, Drancy, France, Jacques Chirac, Jews, Paris, United States Holocaust Memorial Museum, Vel' d'Hiv Roundup by Ellen Count. Bookmark the permalink. The French Resistance destroyed the train track ahead of the first train and saved 600 children including Claude a Jewish client of mine, after this initial brave act the Germans made sure that any further attempts at rescue were halted.